Thanks for the help , guys. These were very cool suggestions. The boots solution was easy: lots of blue shade (darker blue) as they appear against the background. The underwear and the gloves had a problem: next to the torso, to much shade left them indistinguishable (tangled with the body), and the shine should give the player the impression it is the same color of the torso (lighter blue). You both gave me the answer together: clear the area around the arms, and contrasting them more against the backdrop, solves these problems , and leave Megaman slimmer, solving the problem of fat torso caused by the shadow. I like that last edit you made. Also, how about a spot shine on his helmet? I made some MM1 weapon colors and some other alternate colors. O projeto parece bem interessante. Mal posso esperar pela versão full. Boa sorte, Amaweks! The project looks pretty interesting. I can't wait for the full version. Good luck, Amaweks! I really hate to say it, guys. But I don't like the new one AT ALL. I want it for the Redux hack! I like the last one, but it does make him look a lot less cute/boyish and more like a typical action hero dude. Mini-reviews, retro sound chip tribute, romhacks and general listage at my site: Mini-Revver. 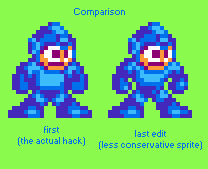 In my opinion you should keep Mega Man's original body weight the way it is, because I think his new body weight on the new edit that you made looks kinda weird on him. You should keep all the sprites the way they are and just change the colors because I'm really impressed on the new colors that you added to the game. You did a great job on it. But I understand what you saying, to keep the original shape of things. And, what about the shine n the helmet, middle blue or bright blue? Yeah, the helmet spot should be the lighter shade. Let me be clear: I don't think that the new sprite is badly done, not at all! It's much more a question of taste. I like the childlike stature of the original best. My favorite is probably the one pixel edit that MasterGwonam did. Maybe keep "fat" (which never seemed fat to me) as the standard, since it's the most true to the original and provide the more V-shaped "Marilyn Manson" as an option? Number 2 is definitely the best! I'm okay with the current sprite, although number 2 does look good too! 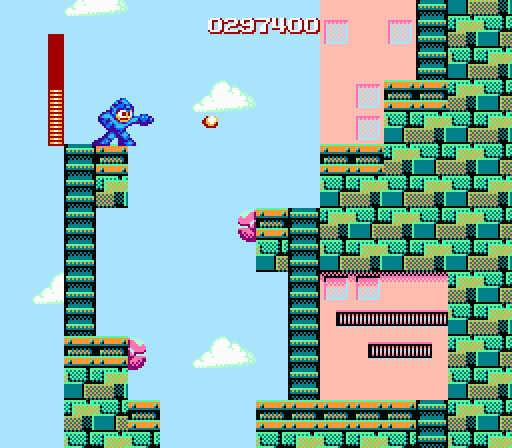 Did Megaman have a tan session? His face looks too orange, maybe some lighter tones for his face would be nice. 2 is the best so far I think, though the helmet shine should be more in the front to be consistent with the rest and there was no reason to make the foot smaller. Well, that's enough for the stand sprite. I will definitely stay with the last edit. Thanks for the help and suggestions, guys. I think it's all a matter of choices, between a more conservative or more daring modification. I stay in the middle of the two while maintaining the overall form, but rather by modifying the pixels inside the silhouette. But, if appropriate , modify the shape, the silhouette, of all the sprites on the game, which is beside the point . The intention for this hack has always been to make the game more colorful as possible. Some curses come on time, and your way of spreading it was with a funny and accurate image. This is a problem that I stopped trying to solve in the beggining. The NES has few colors, and the problem of the original color in this new sprite style is that the skin has a clor very close to the white eyes, and far from the red or purple mouth and shadows, giving it a bad color ramp. 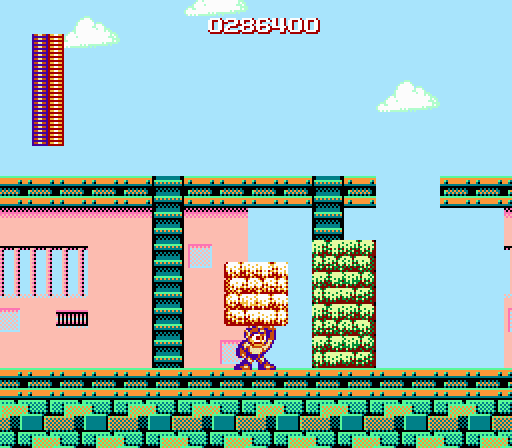 So I made that choice: put a much more vibrant color (a "2*" instead of "1*" which is not the ideal) and give the feeling that the character is more colorful, similar to that some Master System games. Yes, the no reason to make the foot smaler, I agree, fixed. i have wondered before about the direction of the helmet spot light. The light source comes from the sprite northeast. And the shadow of the helmet is facing northwest. The question here is if I can give me the freedom to be unrealistic about the light source , and I believe that yes, I can have that freedom. In the case of such a small sprite, and that is mirrored in real time during gameplay , I do not see much problem with some inconsistencies in the light source , since in general all work as a whole. Moreover, in design terms, we can add more than one light source (reflections coming from the ground or from bright objects in other directions). So, no big deal with it , I gess. Next time I'll came here will be to show some changes, specialy with the blocks in CutsMan stage. I like the original way where it shows the boss level your about to enter. I don't mind the boss selection screen but the screen where it shows the boss and the total points for beating him is too much. I rather it be the original way since all the other games are the same. Also, can you possibly remove the score. There is no need for it. If it were possible I would change the selection screen for picture frames, which unfortunately is beyond my skills. I prefer to leave the score and other details like the original, my interest is hacking the game graphics, making it look as colorful as possible. Would it be possible to somehow enhance the contrast between Megaman's face and the whites of his eyes? 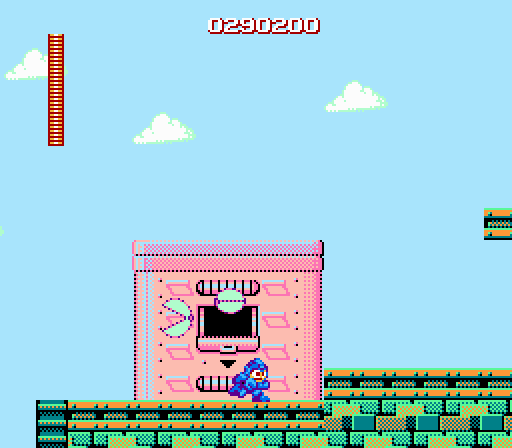 It has always been hard for me to tell where the whites of Megaman's eyes start, and where his face ends. Change the skin tone ever so slightly, or whatever. But bring out the whites of his eyes somehow. This is the most contrast I can get (the original color is almost white, the color in the hack is a light orange. 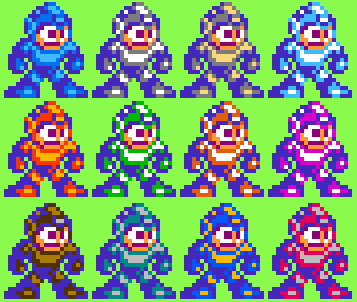 More contrast than this and megaman face will be to much darker. Page created in 0.115 seconds with 17 queries.